This quick and easy cable hat purse neckwarmer pattern can be worked up in a couple of hours - depending how speedy you are with your hook! I worked up this sample set in TLC Amore (worsted or medium weight yarn)- both the hat (3rd size) and purse (smallest size) came from one skein of plum (6oz - 170g). You can use any yarn which works up to the gauge below. Finished sizes fit up to: 15" (17.5", 20", 22.5") circumference. Instructions apply directly to the first size, all other stitch numbers apply to the relevant size in ( ). I used a size 5.5mm, I-9 hook. The Gauge is 13 stitches and 10 rows = 4 inches. 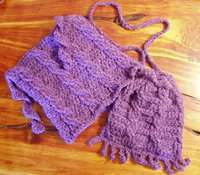 You will need to know how to work front post double crochet (fpdc), back post double crochet (bpdc),and the cable row, half double crochet, chain and single crochet, and the twisted tassels. And now for the cable hat purse neckwarmer pattern...Chain 48 (56, 64, 72), turn. Ch1, hdc in 3rd ch from hook, hdc in each ch to end, ch1, turn. Hdc in next st, *fpdc in next 4sts, hdc in next 4 sts, rep from * 4 (5, 6, 7) more times, fpdc in next 4 sts, hdc in last 2 sts, ch1, turn. Hdc in next st, *bpdc in next 4sts, hdc in next 4sts, rep from * 4, (5, 6, 7) more times, bpdc in next 4 sts, hdc in last 2 sts, ch1, turn. (Cable row) Hdc in next st, *sk2 sts, fpdc in next 2 sts, go back and fpdc in 2 skipped sts (forms cable), hdc in next 4sts, rep from * 4 (5, 6, 7) more times, sk2 sts, fpdc in next 2 sts, go back and fpdc in 2 skipped sts, hdc in last 2 sts, ch1, turn. Rows 2 - 5 form the cable pattern. Work straight in pattern as set for 6 (6, 7, 8) inches. Next, for the cable hat purse neckwarmer pattern...fold in half so side edges are together. Crochet or stitch side edges together and finish off ends. So how is this a cable hat purse neckwarmer pattern? Well, for the HAT, continue as follows...right side out, re-fold your piece so that the seam is in the center at the back. Pin or hold your piece in place. Working through both layers, starting at the top right corner join in yarn and work one X 20ch long twisted tassel, sk1 st, sc in each st to last 3 sts, work one more 20ch long twisted tassel, sk1 st, sc in last st. Finish off and work in ends. That's the hat done! Here's the PURSE part of the cable hat purse neckwarmer pattern...right side out, re-fold your piece so that the seam is in the center at the back. Pin or hold your piece in place. Working through both layers, join in yarn and sc in first st, *ch5, sc in each ch (forming fringe section), sc through both layers of purse in next st, rep from * to sc in last st. Finish off ends. For PURSE STRAP - ch100, sc in each ch, finish off. (The strap can be worked any length. Just decide how long you want the strap, divide the inches length by 4 inches, then multiply the result by 13sts to get the number of chains. ie. for a 40inch strap... 40/4 inches = 10, 10 X 13 = 130sts.) Weave in ends. At front of purse from center towards left, thread strap behind each cable twist holding onto end. Tie ends together in knot at center front. Pull strap so shoulder length comes through between 2 cables at back of purse. Now the purse is done too! 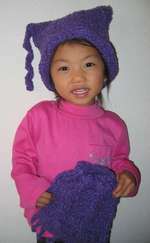 So - now you see how this is a cable hat purse neckwarmer pattern? Easy! This would make a great gift, either as a set or as individual pieces. How about a beautiful lattice scarf?